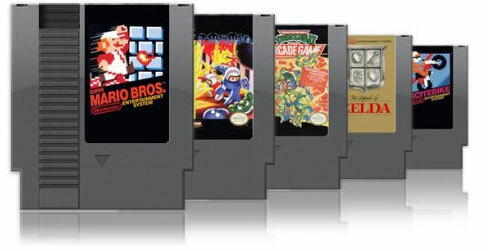 The 8-Bit Generation are those born in or around 1980 who knew a time before Nintendo, Nickelodeon, and personal computers. Their favorite video games are The Legend of Zelda, Super Mario Bros, and Final Fantasy. Their technology’s performance could still be influenced by blowing harder on the controller or by demagnetizing the tape deck before use. If you said, “I don’t know,” you were likely to get slime dumped on your head. In 1986 Double Dare debuted and the Space Shuttle Challenger blew up. We knew technology could fail us and that we were all still human after all, but we all still had land lines and it was expensive to call long distance. 900 numbers ruled late night television when Nick at Night was still playing My Three Sons. Nowadays it plays past episodes of Full House, the same show that played when the 8-Bit Generation was in elementary school. Some elementary schools had Apple II’s, but by the time they got to middle school, public schools had begun buying personal computers (PCs) running DOS and the first versions of Microsoft Office. By high school they would have PCs running Windows 95 and the Internet. They would be the last generation to grow up without having the Internet their entire high school career and the last generation to not have cell phones in the class room. The closest any of the 8-bit generation had to a cell phone in high school was a beeper because most cell phone’s batteries were so large you could only use them in your car. Most Internet connections at home were dial-up and AOL ruled the land with it’s floppy disks. The first CD-R drives cost $400, more than some computers cost today. The 8-Bit Generation went to college in the middle of the Dot Com Crash and 9/11. They graduated with less hope of finding a job than their immediate predecessors, Generation X. They still dressed like they did in high school. They think a Polo over a t-shirt and some stone-washed jeans is cool and if you swap the pants for some khakis and add a sweater they’re dressed up. They believe white shoes are for dorks and prefer leather shoes like Dockers or Doc Marten’s. They think of Angelina Jolie more of a Hacker than of Salt. They believe the future is possible and that it is here. They don’t want to work, but they will. Not everything was handed to them, but they did have it easier than their parents, but their children may not. Those children, the sons and daughters of the 8-Bit Generation are now in kindergarten and elementary school. They are using iPhones and iPads to communicate and play games. They’ve never known anything other than always-on broadband Internet, streaming movies, video games on cell phones, and text messaging (they don’t even know or care what AOL is). They are the 64-Bit Generation. This year (2010) we’ve seen Toyota recall vehicles for sticky accelerators and engines that randomly stop. We’ve seen cereal from Kellog’s and medicine from Johnson and Johnson recalled for weird smells and tastes. And we’ve seen a steady stream of just downright bad-for-you stuff from China including cadmium-covered glasses at McDonalds. All signs point to the Nintendo generation being in charge of quality control. With their “80% is good enough” mentality, most of the stuff we drive, eat, and drink out of is good alright, but it’s that last 20% that is questionable. Is this a sign of things to come? What happens when the 8-bit generation takes over the power grid, the water system, and air traffic controls? I guess having power for 80% of the day is better than Baghdad, and that’s good enough for me.